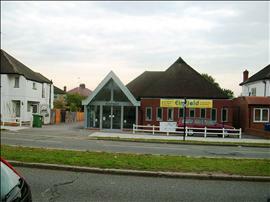 This venue is situated in North Harrow. The nearest mainline station is Harrow on the Hill. The nearest London Underground Stations (equidistant from the venue) are Rayners Lane Station which is on the Piccadilly and Metropolitan Lines and North Harrow Station which is on the Metropolitan Line. The dimensions of the designated parking bay(s) are 260cm x 600cm (8ft 6in x 19ft 8in). The nearest designated bay is 2m (6ft 7in) from the main accessible entrance. The car park is 5m from the venue's entrance. The ramp or slope is located directly in front of the main doors. The width of the ramp or slope is 400cm (13ft 1in). There is a push pad to operate the doors and it is located on the left hand door pilllar, 88 cm from the ground. The reception desk is 2m (6ft 7in) from the front entrance. The hearing assistance system is only available in the main hall. The accessible toilet is located on the right by the entrance to the main hall. The dimensions of the accessible toilet are 146cm x 224cm (4ft 9in x 7ft 4in). The towel dispenser is 112cm (3ft 8in) high. The accessible toilet is also equipped with a roll in shower. The female toilets are located on the left in the corridor leading to main hall. The female toilets are 10m (32ft 10in) from the accessible entrance. The male toilets are located on the left in the corridor leading to main hall. The male toilets are 11m (12yd) from the accessible entrance.